Home Proclamation No. 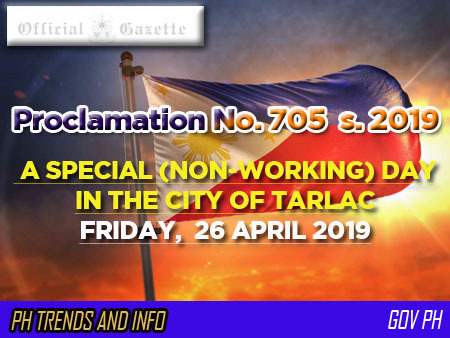 705 s. 2019 Declaring 26 April 2019, a Special Non-working day in the City of Tarlac. Declaring 26 April 2019, a Special Non-working day in the City of Tarlac. DECLARING FRIDAY, 26 APRIL 2019, A SPECIAL (NON-WORKING) DAY IN THE CITY OF TARLAC. NOW, THEREFORE, I, SALVADOR C. MEDIALDEA, Executive Secretary, by authority of the President, RODRIGO ROA DUTERTE, do hereby declare Friday, 26 April 2019, a special (non working) day in the City of Tarlac. Done in the City of Manila, this 3rd day of April, in the year of Lord, Two Thousand and Nineteen.